By Noa Levin / Oct. 7, 2018, 5:18 p.m.
On August 9, a Saudi-led airstrike hit a school bus in northern Yemen, killing dozens—several of them children. Airstrikes like this are not new for Yemen. They are part of an ongoing war that began during a failed political transition and has plagued the country for roughly three years. The United Nations has labeled the conflict one of the worst humanitarian crises to date, with death toll estimates ranging from 10,000 to nearly 50,000. The war has triggered strong responses from numerous countries and humanitarian non-governmental organizations (NGOs). Since the airstrike on August 9, many have scrutinized the violent tactics being employed by those involved. Despite the blatant human rights violations and immoral actions surrounding the war, the United States has involved itself in the attacks led by Saudi Arabia by supplying them with arms and intelligence. Given the recent strikes and the high toll of civilian casualties, the United States must reevaluate its involvement in Yemen’s vicious war. The war in Yemen began in 2011 when then-president Ali Abdullah Saleh tried to install his son as his successor, triggering a violent uprising and eventually a Mubarak-esque fall from power. In order to understand why the transition evolved into a civil war, one must rewind to the late 1990s, when a group of Shia rebels known as the Houthis were growing. The Houthi movement began at a religious school in the Saada province in northern Yemen in 1992. Their ideology drew on an Iranian branch of Shiite Islam called Shia Zaidi, which rejects the notion that Imams must come from one line of descendants. The school was sponsored by Saleh, who allegedly supported the school because he hoped to create a group of religious militants to counter Sunni Saudi Arabia’s territorial expansion and aggression. In 2000, Saleh was able to make amends with Saudi Arabia through a border demarcation agreement and no longer needed Houthi military support to oppose the Saudi threat of expansion. Saleh then urged the Houthis to demilitarize, but the Imam of the school had already turned the group into religious extremists, drawing inspiration from the Iranian revolution. They supposedly began receiving aid from Iran. In 2011, when the uprising took place, the Houthis decided to support domestic opposition to Saleh, forcing him to pass down his regime to his deputy, Abdrabbuh Mansour Hadi. Hadi struggled to deal with Yemen’s various problems. Poverty, corruption, and aggression tormented his regime. The Houthis capitalized on Hadi’s lack of strength and took control of the Saada province to increase their presence in 2014. They then moved to the capital, Sanaa, and forced Hadi into exile. At this point, Saleh decided to join the Houthi side, even though they had contributed to his downfall. The Houthis thus began their fight against Yemen’s current regime, embroiling Yemen in its current civil war. In early 2015, foreign powers got involved, aiming to restore Hadi’s regime. A coalition of eight predominantly Sunni states, led by Saudi Arabia and backed by the United States, the United Kingdom, and France, began an airstrike campaign against the Houthis. For the Arab states in the Saudi coalition, fighting the Houthis also meant fighting Iran—a long-time enemy—because Iran supposedly backed the Houthis (Iranian leadership denies giving its support). Saudi Arabia fears that Houthi military success in Yemen would allow Iran to infiltrate the country as well, thereby growing their regional power. Unfortunately, international participation has escalated the war and resulted in the perpetration of multiple war crimes. The war has put innocent civilians in immediate peril. Amnesty International reports that 3 million people have been forced to flee their homes and 22.2 million people are in need of humanitarian assistance as a result of the violence. Leila Hayal, who lost her mother and four siblings due to a Saudi coalition airstrike, reported that “the force of the explosion sent my sisters and mother flying five metres, killing them instantly. Hani’s body was not dug out until 12 hours later. My father Faisal (60) was the only survivor.” Her terrible story mirrors thousands' of others who have lost parents, children, and homes during the war. Both sides are to blame for the horrific crisis at hand. The use of imprecise weapons by the Houthis and the Saudi coalition have resulted in unnecessary casualties. Fighters on both sides have conducted airstrikes targeting civilian areas, such as hospitals and the aforementioned school bus. Houthi forces have arrested critics and human rights defenders to snuff out dissent. The Saudi coalition is actively blockading Yemen’s ports and borders, leaving at-risk civilians without needed food and medicinal aid. These activities are in violation of international humanitarian law, which bans attacks on civilian buildings and medical facilities and offensives launched from civilian areas. 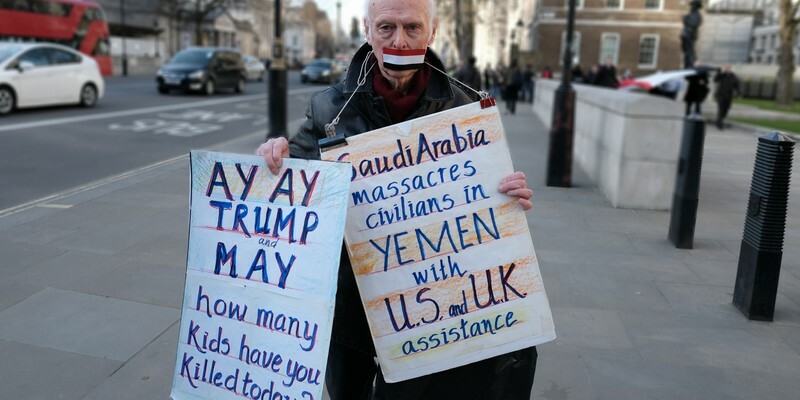 While it is hard to imagine the United States being sanctioned by the international community for its indirect role in many of these violations, the already troubled US legacy in the Middle East will only deteriorate further from the irreparable harm being inflicted on innocent Yemenis. US military efforts in Yemen are intended to impede the growth of terrorism in the Middle East, specifically to counter the growth of al-Qaeda in the Arabian Peninsula (AQAP). An early statement from the Obama administration read that "a successful counter-terrorism strategy is one that will build up the capacity of the central government to have local fighters on the ground to take the fight to extremists in their own country. ... That is a template that has succeeded in mitigating the threat that we face from extremists in places like Yemen." The US presence in Yemen is currently justified by preventing AQAP from exploiting Yemeni instability, fortifying Saudi Arabian border security, and quelling any risk to American national security. While there are no American soldiers on the ground, the United States has still made a significant contribution to the atrocities of the war and indirectly to the humanitarian crisis that has resulted by supplying the coalition with arms, advanced military equipment, and intelligence. Should the United States Remain Involved? Since the airstrike on August 9, the United States has reportedly reviewed its support for Saudi operations in Yemen's war. However, Defense Secretary James Mattis has reaffirmed US support for the Saudi coalition despite the outcry over the school bus attack and ensuing reports detailing civilian casualties. The humanitarian crisis in Yemen and the war crimes perpetrated by anti-Houthi forces should deter the United States from continuing its financial and logistical support to the Saudis. But given that the administration has not considered these violations to be serious enough, it will take more than than human rights violations to change US policy. Yemen has historically been a graveyard for interfering foreign powers that chose to involve themselves in its conflicts. In the 1960s, the Egyptian president, Gamal Abdel Nasser, decided to back a republican coup against Yemen’s current regime. Saudi Arabia lent its support to the monarchy, and soon Egypt found itself in a costly and unwinnable war. More than ten thousand Egyptian soldiers died, and Egypt incurred large war debts. Like it did for Egypt in the 1960s, Yemen could end up a modern-day Vietnam War for the United States. In addition, the initial US motivation for involvement—thwarting the spread of al-Qaeda and other terrorist organizations—has not been achieved. Conflict-ridden areas are unstable and weak, and therefore appealing to terrorist organizations. Al-Qaeda and ISIS have recognized the opportunities for growth in Yemen and have made territorial gains as a result of the war. Further destabilizing the region will only perpetrate terrorism, not minimize it. Furthermore, the majority of Arab countries in the Saudi-coalition are involved because they want to thwart Iran’s influence in the Middle East. While US policy aligns with that objective, Iran poses a more dire territorial threat to Arab states in the Middle East than it currently does to the United States. There are more productive ways for the United States to handle its relations with Iran than to work with Saudi Arabia in Yemen. The administration should not involve itself in Yemen’s civil war based on the broader challenges Iran poses. Ultimately, the United States needs to reconsider whether its relationship with Saudi Arabia is worth being dragged into horrific conflicts like the war in Yemen. Continued involvement in the war could inflame regional terrorism and will quickly become too expensive relative to its minor potential value to United States interests. Though the high death toll and loss of innocent lives should be incentive enough, staying in Yemen, given its history, would also be an incredible foreign policy miscalculation by the United States. With these considerations in mind, the United States ought to withdraw its assistance to the Saudi-led coalition. Noa Levin is a World Editor for The Gate. Opinions expressed in this article are not necessarily reflective of The Gate. The image featured in this article is used under the Creative Commons 2.0 License. The original was taken by Alisdare Hickson and can be found here.